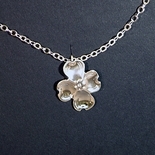 Our dogwood jewelry is made from sterling silver and will surely become a treasured gift. Crafted entirely by hand, using simple homemade tools. Beautifully detailed. Made in the U.S.A.